A képre történő kattintás után megtekinthet minden rendelkezésre álló fotót a (az) Villa Victoria-hoz. Situated 700 metres from Small Pebble Beach, a 9-minute walk from Big Pebble Beach and 1 km from Kas Ataturk Statue, Villa Victoria features accommodation located in Kas. 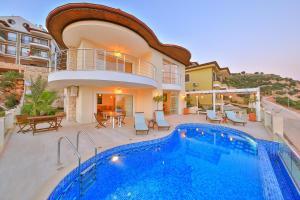 This villa is a 12-minute walk from Kas Yacht Marina and 1.3 km from Kas Hellenistic Theatre. This villa features 4 bedrooms, a living room and a fully equipped kitchen with a dishwasher. A flat-screen TV is offered. Kas Bus Station is 1.3 km from Villa Victoria, while Kas Lions Tomb is 1.4 km from the property. Please inform Villa Victoria in advance of your expected arrival time. You can use the Special Requests box when booking, or contact the property directly with the contact details provided in your confirmation. A security deposit of EUR 200 is required upon arrival for incidentals. This deposit is fully refundable upon check-out and subject to a damage inspection of the accommodation.